North Ridge (the ministry that inspires my weekly posts) is entering a phase in its life that will test the faith of our leadership and all of our members, a building transition. In preparation for the coming months, we started a new series today simply titled, RE: Over the next three weeks we’ll be focusing on three re- words, reveal, re-imagine, and re-launch. He makes me lie down in green pastures, He leads me by still waters. He restores my soul. He leads me in paths or righteousness, for His name’s sake. If we read David’s lyric too quickly (and with a healthy dose of narcissism), God’s just all about you! He gives you rest (personally, I’d need a good antihistamine to relax in any pasture) and gives you peace beside water so still it offers a perfect reflection of the passing clouds. On top of that, He re-invigorates your soul and leads you down the right path so you never get worn out and always make the right choices…..sounds like a sickeningly sappy Hallmark card! God does give us all these things, as we need it. God will give you rest, after you’re tired. He will give you peace, when life is turbulent. Something (or someone) can’t be restored before damage occurs. Being led down a path requires your effort to follow. None of these courtesies from God are experienced out of desirable emotions, they are all ways that God pulls us out of a mess, most often one of our own creation. So why does God offer us these pleasantries? The last phrase; for His own name’s sake. God gets us through the rough patches in life to amplify his presence in our lives. Certainly, God is for you, but the point of life is not you. Dean painted an excellent picture of cat and dog theology (cat people, I apologize in advance). When you come home from a long day at work, your dog runs to greet you at the door. The dog knows this is the person who feeds me, pets, me, cares for me; this person is God. When a cat owner comes home, the cat doesn’t move, uncaring that its owner is home. To the cat, this person feeds me, pets me, takes out my poo, cares for me, I must be God. The church is infected with cat theology. I will say to the north, give up, and I will say to the south, do not withhold; bring my sons from afar and daughters from the ends of the earth, everyone who is called by my name, whom I created for my glory, whom I formed and made. Two phrases viciously captured my attention this morning: ‘for his name’s sake’ and ‘do not withhold’. God didn’t create any person for the purpose of “saving their soul”, creating humans was not the epitome of God’s motivation for life’s inception, pointing humanity to himself is the missio dei, the mission of God. These phrases inspired to depict an image of starting a race, being “let out of the gate”, so to speak. I didn’t like the imagery of a horse’s gate opening to start the Kentucky Derby because all the focus is on the horse, how well he can race and who he can beat. Not the message from today at all. I settled on an image used to represent spiritual transformation for years, the butterfly, but put a surreal spin on it. 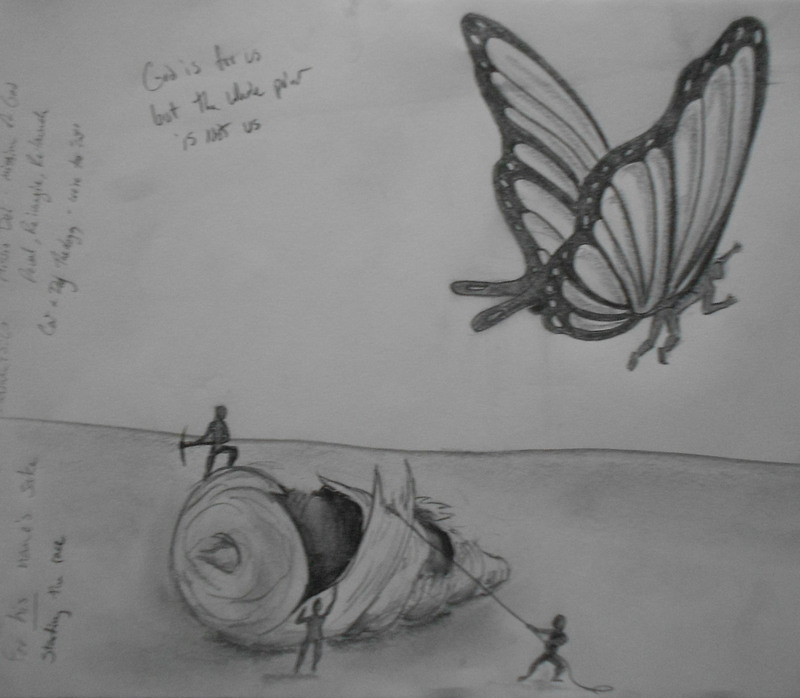 The butterfly does not break out of its cocoon by its own strength in this image, three shadowy figures break the casing with picks and rope, releasing the beautiful organism from its restrictive shell. Spreading its wings, the butterfly reveals its body, not that of a caterpillar, but a human body with a butterfly’s wings. When I watch a butterfly, I rarely think about the arduous situation the caterpillar experienced in order to morph into this beautiful winged creature. I immediately see the splashes of light and color an artist would apply to a masterpiece, I see the ultimate artist who creates such beauty. When life gets hard but yet we soar, the world sees the same creator through us. The love of God towards me as a sinner is not God making much of me but rather Him freeing me up to make much of Him. Now im scared of butterflies too..! I’m glad this week’s post connected with you, Laura! Thank you for the share (please share a link to the blog with the quote)! I can’t take the credit for the last line, I stole it from Dean’s sermon, he read it as he prepared the message last week, and I think that author may have adopted it from John Piper!